Lightweight backpacking requires careful planning to assure that every item you bring is really necessary, and that each item is as light as possible! You'll be traveling for weeks, if not several months. A backpacker who's on a 4 months trip, carries his/her bag for 38 hours (average time). This includes the time you use on traveling overland, traveling from city to city and the time you use to search for a guesthouse at a new destination. And if you don't like the guesthouse you stayed at the first night, you'll likely want to switch to a better one, which means more walking and more carrying. ... All this time, you have to carry your backpack. This may not seem like a long time to you. But when you're carrying a 55-70 liters backpack for 38 hours, your back and legs will pay the price! Taking the Tuk-Tuk (motorcycle taxi) is the common way of traveling around a city, in Thailand, Cambodia and India. So, let's say you're going to take a Tuk-Tuk from the bus station to the guesthouse. The carts on these Tuk-Tuks are usually small. It's so much easier to just slip in your small backpack into the cart, instead of forcing it in. The same when you're traveling from city to city. If you take the (local) bus, you can fit in your backpack between your legs, or the top shelf over your seat. Lightweight backpacking is much more fun! The goal with lightweight backpacking is about being comfortable with less weight on your back. And confidence is important too. It's not about sacrificing the essential items - it's about keeping them! Accept the fact that you don't need to pack like, 20 t-shirts, or your laptop. When you've thought it all through, and every item is useful and necessary - this will develop confidence in your gear and abilities. This way, you'll know what's heavy and what's light. Example: You have two books in front of you. Let's say, Book A and Book B. You weigh them. It seems like Book B weighs more than book A. Which one do you leave at home? - Book B of course. Swiss knives are the best in my opinion. Depending on the model, a Swiss multifunctional knife has between 1-80 different functions. Like, blade, can opener, scissor, nail clippers, nail file, flash light, tweezers and much more. Bandana is the all-time multi functional item. It can be used as scarf, napkin, handkerchief, wash cloth, lens cleaner and sunglasses case. The use of bandana is only limited by your imagination! Sarong is another multifunctional item. It can be used as a skirt, beach mat, sheet, tube dress, scarf, curtain, protection from sun, dust and to cover your head in the temples. Universal adapter: Instead of bringing 5, bring one adapter that covers all the major appliances. Safety pins: Helpful to secure bandages, use it as a lock if your daybag hasn't got any and use safety pins as hooks to hang items. Convertible cargo pants: The typical activities in Asia are trekking and sightseeing. If you're going to trek a lot, buy convertible cargo pants. There are so many types of cargo pants which can be used as shorts as well - either detachable cargo pants, or roll-up cargo pants (where you just roll up the waistband). Excellent for city walks and parties. Bikini top: Skip the bras ladies! Whether you're snorkeling, partying, trekking, shopping - bikini tops are the best! They're compact, light and breathes more than cotton bras! The heavy items are your problem. And the heaviest items used by most backpackers are the backpack, travel guide book(s) and the toiletries. Buying a small pack will ensure that you have the discipline to pack light. A small pack makes you think seriously about the compactness and lightweight for every piece of gear and clothing that is chosen. "I could fit in this...and this...and this." Before you even know it, you have a fully packed 55-liter backpack! OUCH! So, if you buy a small pack, you have no other choice but to pack light...! If you still want a large backpack, let it be one of those lightweight backpacks. Read good tips on how to choose a backpack. Bring small bottles of things that won't run out fast. Like deodorant, toothpaste, shaving cream etc. If you want to try something new, buy tooth powder. Many backpackers prefer tooth powder, instead of tooth paste because it's lighter. To read more about what toiletries and medical supplies to bring for your backpacking trip, click here! If you're going to travel to different countries, check if you can buy a travel book that covers all these countries. Instead of bringing 4, bring 1. Like, Lonely Planet and Rough Guides have one guide book that covers all the countries in Southeast Asia. If you can't find one book that covers it all, this is what you do. The question is: Where are you traveling first? Example: You're going to India first, then travel to Thailand later. Buy a travel book for India before departure. When you get to Thailand exchange the travel book for India, with a travel book for Thailand. Do the same when you arrive in Cambodia or Laos. There are many book shops/stalls in the big cities in Southeast Asia, where you can exchange books. By doing this, you'll definitely save weight in your backpack. Instead of buying books, invest in Kindle ebooks or an iPad! All you need is wi-fi! :-) You should consider eBooks. Lonely Planet offers digital chapters or books. Is it useful? Do you really need it? How many times will you use it? - Just once - is it worth it? If the answer is "yes" to all of the above questions, pack it. If it's a "no" on one question, leave the item at home. Yes, an item should be dependable. An example is your backpack. Don't buy the cheapest backpack you can find. Your backpack is your essential. And if your backpack decides to fall apart during your trip... awh..the thought of it is just… scary! A backpacker's nightmare! If you were caught-out without it, would you be in a safe and secure situation? Don't make any cutback where it might compromise your safety or others! When choosing clothes, one clothing must match another one. You have to sort this out in your head before you pack. If you're planning to bring a sweater that doesn't fit in with the rest of your clothes, leave it at home. Don't pack it just because you hope that you will wear it sometime. Go through each theme thoroughly. Example for day wear: Your plan is to pack two shorts and 6 t-shirts, but you have 4 shorts and 10 t-shirts in front of you (because you like the color of all the items). Oh crap! Which ones do you choose? Choose the clothes that matches together (in terms of color, comfort or both, if that's your preference). 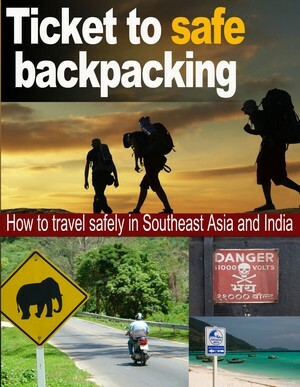 This article is a taste of what you can expect in my eBook "Ticket to safe backpacking" in SE Asia and India. In this ebook, you'll find valuable tips on common backpacking safety, how to avoid scams and much more.